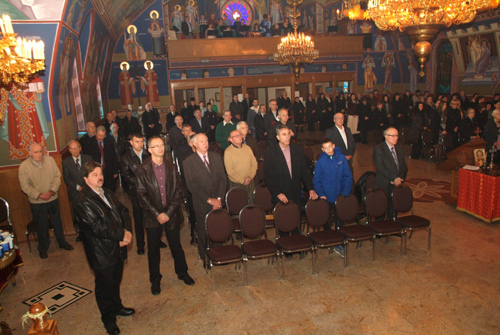 Hamilton, Onatario - The St. Nicholas Cathedral in Hamilton celebrated their Church Slava on Sunday, December 21, 2014 with the Holy Hierarchical Divine Liturgy and Slava luncheon. The Holy Hierarchical Liturgy was officiated by His Grace Bishop Georgije of Canada, with the concelebration of V. Rev. Dusan Gnjatic of Kitchener, the host priest V. Rev. Stavrophor Milojko Dimitric and V. Rev. Djuro Samac and the diocesan deacon, Deacon Stefan Ikonomovsky. 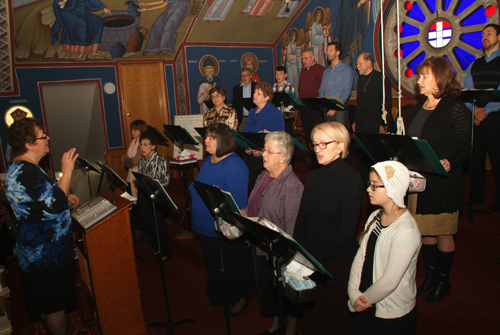 Many parishioners attended the Divine Liturgy and approached the Holy Chalice. In his homily His Grace, the bishop, reflected on the gospel reading telling the faithful that we are all called to serve God in our churches. "Never in your life place material goods before spiritual goods," the bishop stressed. After the liturgy the Slava Kolach was cut in the church hall with Slava kum, Damljan Gligic. The Slava luncheon was prepared by the hard working Kolo Sestara. V. Rev. 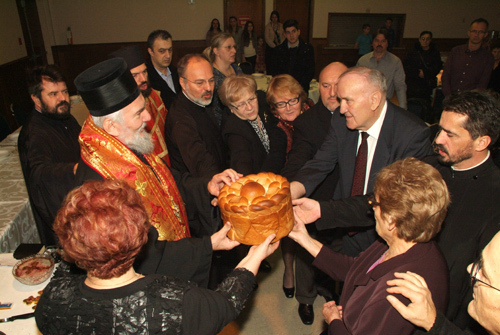 Milojko thanked Bishop Georgije as well as all the guests who took part in the Church Slava. 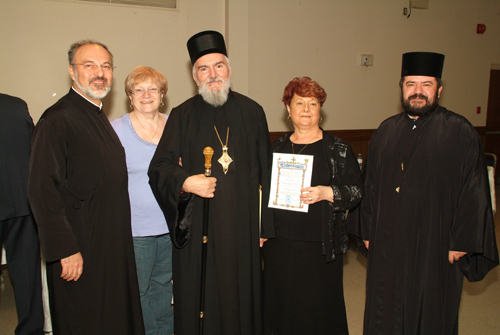 At the end Bishop Georgije gave Gramatas to sisters Mira Terzic, the honorary president of the Kolo Sestara "Velika Gospojina". The bishop praised the effort and selfless work of the sisters, stressing that this recognition was also gratitude to each sister and member of the Kolo. Mira Terzic with her family acccepted to the kumstvo for the following year's celebration.